1. Quiz: What is also known as 'God Particle'? 6. Quiz: Galvani used what eccentric objects in his studies of electricity? 7. Quiz: What do you call elements with Atomic Number between 57 and 71? 8. Quiz: What are the four forces of nature? 9. Quiz: Two scientists independently discovered differential and integral calculus. Who were they? 10. Quiz: What is a 'cosmic year'? 11. Quiz: What is Pangea? 12. Quiz: What is 'escape velocity'? 13. Quiz: For what is 'lockjaw' another name? 14. Quiz: A catalogue of what would you find in the AG catalogue? 15. Quiz: What is the name of the device that will permit one to pass between regions of differing atmospheric pressure? 16. 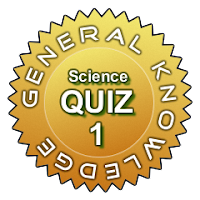 Quiz: Name the most abundant metallic element in the Earth's crust. 17. Quiz: What is an annual ring? The increment of wood add up by a year's growth; seen in the cross section of trees. 19. Quiz: Where were dodos found? 20. Quiz: Who invented the aqualung? 21. Quiz: Name the doctor who invented the heart-lung machine. 22. Quiz: What does the Geiger counter measure? 23. Quiz: Jupiter has ----- confirmed moons (4,24,64,84)? 26. Quiz: What happened to the three men who manned Salyut 1 for 23 days? 27. Quiz: How long would it take to reach the sun if it were possible to drive through space at a steady 55 m.p.h speed. 29. Quiz: The lining of stomach contains about 35 mn. What? 30. Quiz: Atherosclerotic food items increases what in human body?